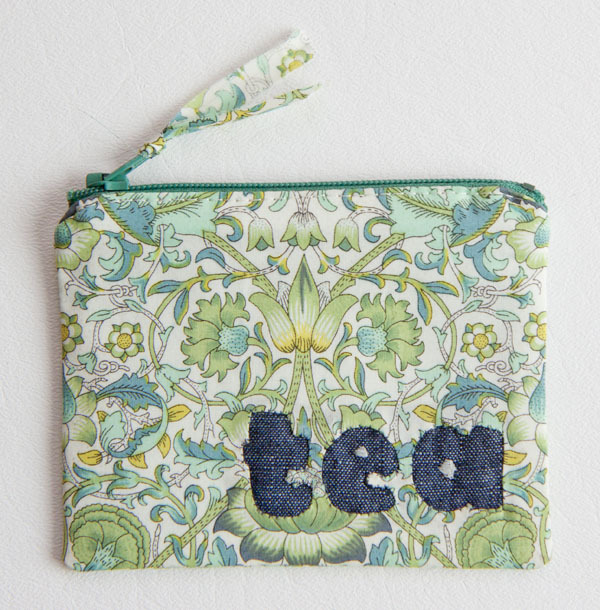 For this week’s zipper pouch, I wanted to make a pouch out of Liberty Tana Lawn. 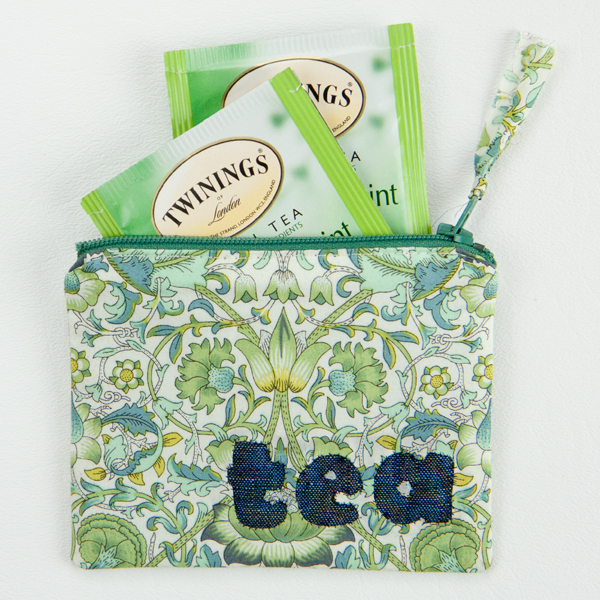 I also have been wanting to make a mini pouch to hold a few tea bags in my handbag. I love having a few packets of peppermint tea with me just in case, and the plastic zip-top bag I keep them in right now is ugly. 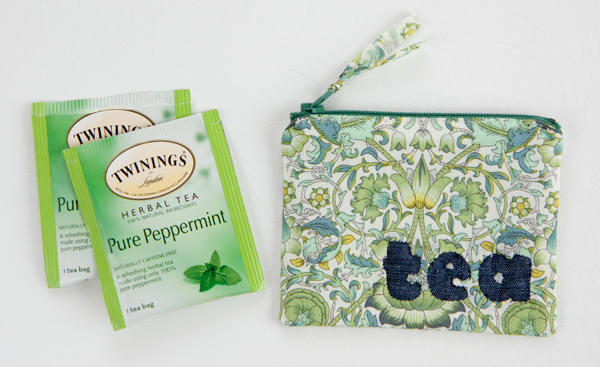 So the idea for a Liber-tea pouch was born. (Ha! I usually don’t like puns but I find this one amusing). I used the font “Berlin Sans FB” at 120 pt. for the letters. I reverse appliqued them using the freezer paper technique, but using a much smaller seam allowance and starch to make it more secure. (Trace the letters onto freezer paper, cut them out, iron the freezer paper to the wrong side of the fabric, snip the fabric within the letters & clip the curves right to the edge, and then tack down the snips: brush the snips with starch and set them over the edge with a stiletto and my Clover mini iron.) I hand stitched around the edges of each letter to tack them down, and I embroidered the letter centers with a bit of cream thread. I will say that this was extremely putzy and fiddly and probably took me close to two hours. If you’re not a putzy person, I would not recommend doing it this way! I would just embroider the letters, or do a freezer paper stencil combined with fabric paint. I didn’t put zipper tabs on this pouch because I find that on little pouches, the tabs take up too much of the zipper, which would make me have to make the whole pouch larger. I am testing a new zipper method and I still don’t have it perfected, but I hope to be done prototyping soon and will post instructions when I have it down. I lined this pouch with a bit of indigo linen. 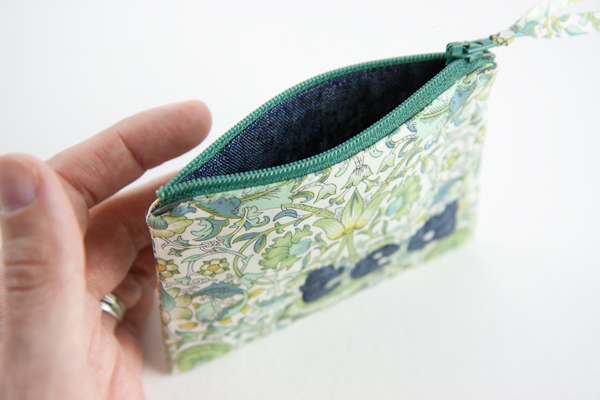 I had a tiny sliver of the beautiful Liberty fabric left over and I used it to make a zipper pull. It is just a strip about 1/4″ x 4″, put through the zipper with a lark’s head knot. The edges are still raw, and frayed a little at first but have mostly stopped now. This is so cute, and the prefect way of using up just a bit of gorgeous fabric, that you don’t want to part with. I’ll pass this link on to my daughter, along with a request I think. So sweet! And your tea bags match! Have you seen the “Becca Bag” pattern from Lazy Girl Designs? I love to make zipper pouches too, and it features the best zipper application ever. The designer also has a Craftsy class that features the Becca and a couple of her other designs.